SOUNDTRACK CREATION | Soundtrack Creation 2018 Composition Playlist on Website! Soundtrack Creation 2018 Composition Playlist on Website! The new playlist containing just under 30 pieces of music which have been composed by Sefi Carmel has gone live on our website. The playlist highlights a diversified selection of some of the music cues which have been written with the big screen in mind. We have been recording some world class musicians here at Soundtrack Creation which feature on the tracks found in the playlist. 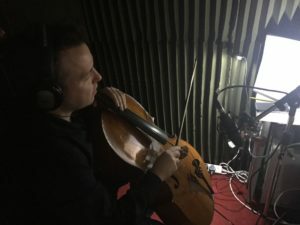 Including Richard Harwood, world renowned cellist who is principal cellist for the Royal Philharmonic Orchestra – a position only the best cellists in world can fill. We also used the talents of Dimitry Van Zwanenberg – a passionate violinist, Gani Tamir – hugely talented and creative singer and Omer Marantz – session guitarist and bass player. These pieces of music can be placed straight into a film and there is a wealth of different moods to set the scene. We have also adapted these pieces when a director may like a particular piece but wants something specific to happen that reacts to the picture. It’s also a great way of showcasing Soundtrack Creation’s music to potential directors and producers who may want originally composed music, this gives them a great idea of the high-level scores that they can expect.